(9/26/16) — Not that long ago, Alex Caicedo was stuck working a series of odd jobs and watching his 1984 Chevy Nova cough its last breaths. He could make $21 an hour at the Johnny Rockets food stand at FedEx Field when the Washington Redskins were playing, but the work was spotty. The Caicedos are among the 3.5 million Americans who were able to raise their chins above the poverty line last year, according to census data released this month. More than seven years after the recession ended, employers are finally being compelled to reach deeper into the pools of untapped labor, creating more jobs, especially among retailers, restaurants and hotels, and paying higher wages to attract workers and meet newminimum wage requirements. Poverty declined among every group. But African-Americans and Hispanics— who account for more than 45 percent of those below the poverty line of $24,300 for a family of four in most states — experienced the largest improvement. Government programs — like Social Security, the earned-income tax credit and food stamps — have kept tens of millions from sinking into poverty year after year. But a main driver behind the impressive 1.2 percentage point decline in the poverty rate, the largest annual drop since 1999, was that the economy finally hit a tipping point after years of steady, if lukewarm, improvement. Over all, 2.9 million more jobs were created from 2014 to 2015, helping millions of unemployed people cross over into the ranks of regular wage earners. Many part-time workers increased the number of hours on the job. Wages, adjusted for inflation, climbed. About 43 million Americans, more than 14 million of them children, are still officially classified as poor, and countless others up and down the income ladder remain worried about their families’ financial security. But the Census Bureau’s report found that 2015 was the first year since 2008, when the economic downturn began, that the poverty rate fell significantly and incomes for most American households rose. After a long period of rising inequality, Elise Gould, an economist at the left-leaning Economic Policy Institute in Washington, added, the benefits of the improving economy finally began to seep downward. Wage increases were “even stronger at the bottom than in the middle,” she said. For those on the lower rungs of the income ladder, a step upward can be profound. For some, it means the difference between sleeping on a friend’s couch and having a home. For others, it is the change from getting shoes at Goodwill to buying a new pair at Target, or between not having the money to buy your daughter an ice cream cone to getting her a bicycle for her birthday. The poverty rate fell in 23 states, with Vermont leading the way. The rest stayed flat; none got worse. And other evidence suggests the improvement has continued, if not as strongly, this year. Mr. Caicedo, 32, initially found his job on Craigslist last summer, starting at $12 an hour. Recently, he was promoted to his salaried position and now drives a 2015 Nissan Pathfinder. His wife was able to leave her job at a clothing store and take care of their four children. 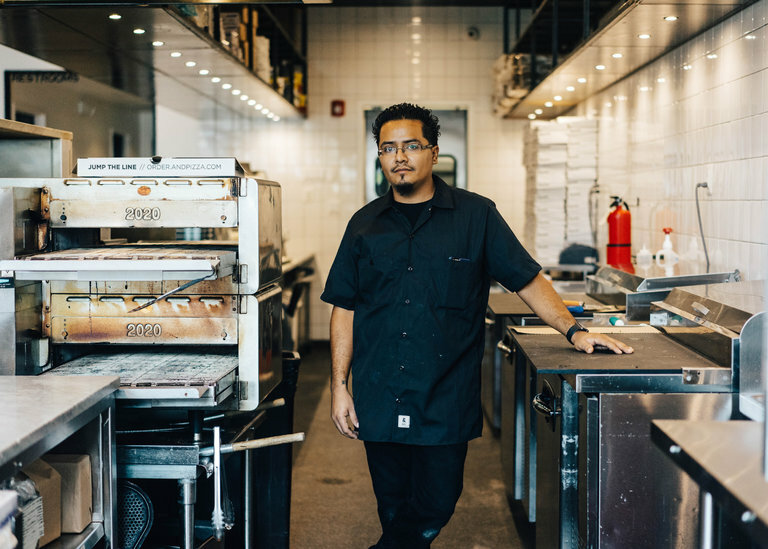 Michael Lastoria, who started the chain called & Pizza where Mr. Caicedo works, said: “We try to pay as close to a fair or living wage as possible,” roughly $2 an hour above the minimum with a steady full-time schedule and benefits. “We want people to have careers, not just jobs,” he said. The availability of full-time jobs at a livable wage may be essential to move out of poverty but is not necessarily enough. Many poor people, saddled with a deficient education, inadequate health care and few marketable skills, find small setbacks can quickly set off a downward spiral. The lack of resources can prevent them from even reaching the starting gate: no computer to search job sites, no way to compensate for the bad impression a missing tooth can leave. Many of those who made it had outsize determination, but also benefited from a government or nonprofit program that provided training, financial counseling, job hunting skills, safe havens and other services. Cheyvonné Grayson, 29, grew up in South-Central Los Angeles, where he, at the age of 14, saw a friend gunned down. Since graduating from high school, Mr. Grayson has worked mostly as a day laborer. In 2014, he was paying $300 a month to sleep on someone’s couch and showing up at 6 a.m., morning after morning, at nonunion construction sites in the hopes of getting work. Often the supervisors and workers spoke only Spanish, and it was hard to understand the orders and measurements. He remembered one foreman looking him up and down, skeptical that he could do the job. “I had to prove this man wrong,” Mr. Grayson said. At every site, he said he tried to pick up skills, carefully observing other workers, asking questions and later reinforcing the lessons by watching YouTube videos. Even so, the work was inconsistent and paid poorly, he said. What made the difference, he said, was getting into the carpenters’ union — a feat he could not have achieved without the help of the Los Angeles Black Worker Center. “That was the door opener,” Mr. Grayson said. 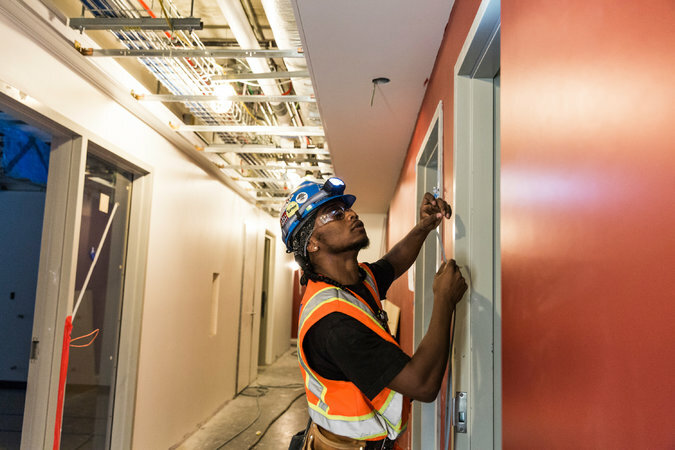 He had to borrow a few hundred dollars for fees and tools, but his first apprenticeship as a carpenter started at $16.16 an hour. He quickly moved up to $20.20 an hour and is paid for his further training. He is now hanging doors for new dormitories at the University of Southern California. For the first time in his life, he opened a bank account. 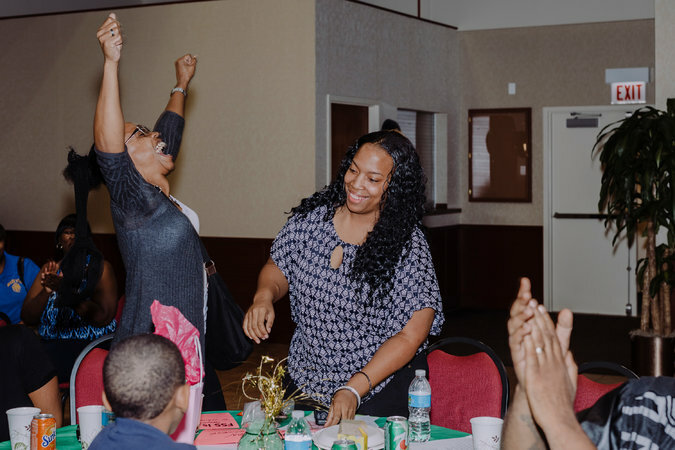 Seventeen hundred miles east, Christine Magee, a mother of four, joined an intensive self-sufficiency program administered by the Chicago Housing Authority and the Heartland Alliance after she fell into bankruptcy from racking up $22,000 in debt on a credit card. As a recipient of a federal housing voucher, Ms. Magee was eligible to enroll. She set three goals after joining the program in 2014: buy a house, raise her dismal credit rating and get a better job that would provide for her retirement someday. Ms. Magee’s husband has found only sporadic work. But she has moved from a health-technician job that paid $23,000 a year and left her family on Medicaid to one at a veterans hospital that pays more than $35,000 and provides health and educational benefits. The extra earnings automatically went into an escrow account. A couple of weeks ago, she graduated from the program with more than $8,000 in savings — which she plans to use for a down payment on a home — and a bank letter confirming she qualifies for a mortgage.